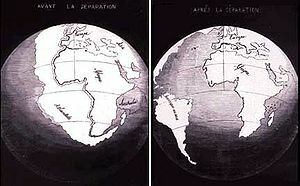 In 1858, geographer Antonio Snider-Pellegrini made these two maps showing his version of how the American and African continents may once have fit together, then later separated. Antonio Snider-Pellegrini (Born::1802–Died::1885) was an American geographer and scientist living in Paris, France who produced, in 1858, two maps representing his version of how the Americas and the African continent could, once have fit together, then later separated. His model theorized about the possibility of continental drift, anticipating Wegener's theories concerning Pangaea by several decades. Pellegrini also proposed a huge decrease of the Earth’s size during the days of biblical Genesis. ↑ David Bressan (Janeiro 19, 2011). "From Contractional theory to modern geology". http://historyofgeology.fieldofscience.com/2011_01_01_archive.html. Retrieved October 16, de 2013. ↑ "Continental Drift & Plate Tectonics". http://www.ridgenet.net/~do_while/sage/v5i3f.htm#footnote5. Retrieved October 16, de 2013. ↑ Scalera, Giancarlo (2-12-2009). "Roberto Mantovani (1854-1933) and his ideas on the expanding Earth, as revealed by his correspondence and manuscripts". Annals of Geophysics 52 (6): 617. http://www.annalsofgeophysics.eu/index.php/annals/article/view/4622. This page was last modified on 3 November 2018, at 14:14.